The bride Hippodame is attended by the goddesses (or perhaps mortal handmaidens) Eurynoe, Iaso and Asteria, and the love-gods Eros and Himeros. It is not clear which Hippodame (Hippodameia) of myth this scene depicts--perhaps the bride of Peirithous or that of Pelops. All of the figures are labelled by the painter. Eurynoe leans towards the bride as the small winged Himeros (Desire) secures her sandal. Hippodame is crowned and served a tray of fruit by the winged Eros (Love). 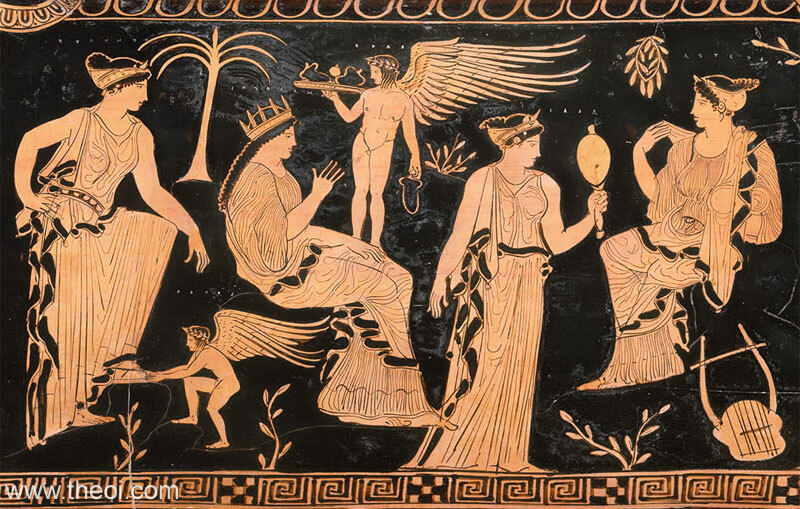 Iaso gazes at herself in a mirror and Asteria is seated with a lyre and wreath of myrtle. This image is a montage of photos of the vase.